School of Fish: Back to school! Back to school in July!?! It sounds a bit crazy to start our school year in early July, but that is what we are doing. Since we hope to be back in the US by the end of April 2015 in order to attend a Global Outreach board meeting, we decided to begin the school year early in order to get in 180 school days. While our summer was just a little over one month long, the kids all seemed excited to start back. Zeke and Bobby had their first day of school with us too. They join us for 2 hours of Pre-school activities. Since they both have several older siblings, they have been asking about when they could start going to school for months. I hope they keep that enthusiasm! 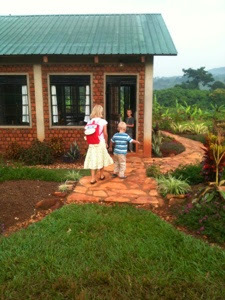 Here is a photo of Zeke dancing his way to school, with Esther escorting him. We are now teaching 7 different grade levels. 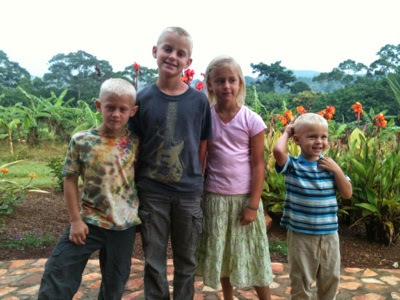 It is quite a bit to juggle, but the older kids are also helping some with the younger ones. It is fun for me to be teaching math from basic counting all the way up to Algebra 2. Honestly, I was feeling pretty overwhelmed thinking about keeping all the kids on track, but it was a great first day! After school I told David, "I forgot how much I love teaching!" It was really a lot of fun! Here is our first day school photo. David is now teaching four different science classes, early elementary science up through Chemistry, along with History, Bible and high school Literature. While it is a very full load, he is enjoying the subjects and excited about this school year. 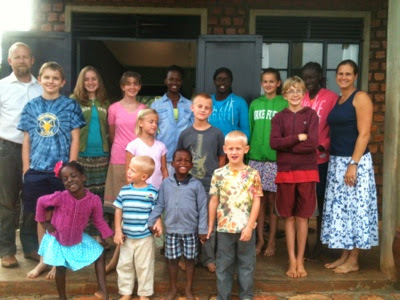 We are both grateful for the opportunity to teach this great group of missionary kids. And now we are able to teach all of our own children too! I am so grateful that God has brought us here to be a part of His work at GSF. It is such a blessing to feel like we are here doing exactly what God has for us to do. Thank you for your prayers and support which make it possible.